Sorry, No Air for You! This morning after a meeting I visited the Apple Store in Orlando (Millenia) to check out the MacBook Air…..perhaps to make a nice impulse buy. I had not yet seen the machine up close, but I knew that it might be the deciding factor. The other major issue is whether my EVDO modem would work. I went to the store carrying my Sierra Wireless 595U to specifically check the fit. 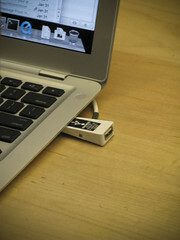 Arriving in the store, all the Air’s have a small USB security dongle. (Shown below) I pulled out my modem and the woman working at the front asked, “What’s that?” I respond, “It’s my EVDO modem, I need to see if it fits” Her response, “Sorry, you can’t do that.” Somewhat shocked I said, “Well, whether this fits or not determines if I buy one of these, can we temporarily remove this?” The response, “Sorry I can’t do that.” Somewhat amazed, I said, “Well then you just lost a sale.” No response back. No Air for me, and I was somewhat disappointed with the poor customer service and attitude of the Apple Store staffer…….it was a 180 to the typical experience. 10 Responses to Sorry, No Air for You! You know, I love my Macbook Pro and loved my Mac Mini before that and much prefer Macs to PCs, but both of my computer-purchasing experiences with Apple Stores weren’t good. The first time I called to hold a Mac Mini ahead of time, they said they would, and then when I got there they said, “oops, just kidding, we didn’t hold one, but there is one in stock up in Alpharetta.” I lived in Marietta at the time, so this was 20 or 30 miles out of my way. This was my first-ever Mac, and I didn’t feel like I was off to a good start with Apple. The second time was mostly my fault because I didn’t call my bank ahead of time to tell them to up the purchase limit on my check card. I had to figure out that’s what happened on my own though, as the Apple people just gave me a dumbfounded “doy, I dunno” look when the card came up declined. I ended up having to come back later to make the purchase after figuring that out. Again, not really their fault, but I seem to not have great luck with Apple Stores. I’m curious what would have been a favorable outcome for you on this. If a manager had come over and told you the same? My guess is disabling these is a hassle. Not that they shouldn’t have tried to find a solution, but if indeed they were unable to disable the security device what then? Apple’s millenia store is constantly crazy busy and the store management brags about having “the most successful store in florida.” They’re very snobby there and losing an MBA sale isn’t a big deal to them unfortunately. If I was working there as an ASM, I would have disabled the system temporarily or grabbed an air that was just lying around (there’s always a spare in the back) and tested it for you to ensure you got results. Although, Apple may know that your device doesn’t fit and didn’t want to waste the time of disabling the security system for that table and risking someone stealing a notebook. Yeah, if it’s not a chore to disable and they can make that happen they should make the effort. Hell if they can;t they should make some effort, which is what it sounds like was missing here. Overall I’ve seen Apple Retail staff quality slowly slide over the past few months. Millennia store was always a little above everyone (part of fitting in there I think), Florida Mall folks always seemed pretty helpful. Sorry but I must also state that I worked as an ASM at one of Florida’s stores for close to a year and we have frequently taken steps to ensure customers buy an iPod case that works for them or is able to test a piece of hardware before they buy the machine. I frequently saw new employees tell a customer “no” which is a big problem when all the employee has to do is give a little. They don’t have to let you run around the parking lot testing your modem but simply grabbing an air that could possibly have been in for repair or belong to an employee would be sufficient and Apple employees love to show off their machines. If your local Best Buy has an “Apple Store” (really just a table and wall), then their Air is totally open without any stupid dongle thing. And the help generally doesn’t hang over you so you should be OK to check your modem out. My assessment after trying one today is they are great for road warriors, really expensive for anyone else. I’m waiting for version 2 and a $500 price drop. Agreed on the Florida Mall employees being much more helpful than the Millenia mall employees. I was at the Best Buy at Waterford Lakes a couple weeks back and they had an Air with an open USB port you may be able to try. Maybe they don’t think folks would really make an $1800+ impulse buy? Obviously the reps in the store don’t work on commission. This kind of things really irritates me. These things are anti-theft devices, not anti-sales devices, and that all too often gets forgotten. To tell a story about the opposite issue, my local Best Buy has (surprisingly) rocked on this front. Twice. Second time, I wanted to see if a Microsoft Bluetooth mouse I was buying for my wife for a present would actually work with the Mac. (According to the iPhone Amazon.com interface, the reviews stated that it was iffy) The reps not only opened the mouse, but let me install the software on one of the Mac demo machines. It didn’t work very well, so I opted for the Mighty Mouse. Both times, they were more than happy to go to the effort. Very cool.